JiuZhaiGou Valley in Tibet Autonomous Region TAR PRC .See larger image at www.flickr.com/photos/wittysam/8104583584/ A UNESCO WORLD HERITAGE SITE and a scenic area in TIBET. TAR. 2nd most beautiful place on the Habitable Earth after Himalayas for me. A concise practical guide to visit the places mentioned in my second published book "111 Miraculous WONDERS OF WORLD you must see when you alive" Download it to your mobile or better print it and use the info while exploring the places. BELOW IN DISCRIPTIONS TO SKIP TO MAIN PLACES TO SEE RATHER THAN ALL IMPORTANT TIPS. ***I suggest read all tips before you start your journey at least you are not referring to loads if information like I did. Have a excellent trip !!! It is a nature reserve and national park located in northern Sichuan province of southwestern China. Jiuzhaigou Valley is part of the Min Mountains on the edge of the Tibetan Plateau and stretches over 72,000 hectares. It is known for its many multi-level waterfalls, colorful lakes, and snow-capped peaks. Its elevation ranges from 2,000 to 4,500 metres (6,600 to 14,800 ft). ****you may not be able to cover all or any part of this area if you have less than 20-24 hours effectively from time you land in JZH airport to time you leave JZH airport. But you can take a 1 or 2 hour drive on the other side of route when you reach JZH airport area after travelling from historic site to JZH airport while heading back to your destination provided you taking last flight of the day which approximately leaves at 19.20 hrs. *** the valley inbetween MAIN JZH historical site and JZH airport is also very scenic try to travel back 3 hours before flight departure time and when its not dark to take nice pictures of townships and cultural resorts on way to airport *** you can see many views of Honglong Scenic area which is near to airport but on other direction of Jiuzhiagou scenic area and even bird eye view from aircraft when your take off from JZH. Jiuzhaigou Nature Reserve Jiuzhaigou (??? Jiuzhàigou) is a nature reserve in the north of Sichuan province in south western China. It is officially known as Jiuzhai Valley in English. It is known for its many multi-level waterfalls and colorful lakes scenic valleys and also as the habitat of giant pandas though due to excessive tourism potential of area you may not find then easily or not at all . You can see pandas in Chengdu breeding Center and in Chingqing Zoo though. It was declared a UNESCO World Heritage Site in 1992. Jiuzhai Valley (Jiuzhaigou) is a major feature of the Sichuan Scenic Area, located 350 km north of Chengdu, the capital of Sichuan province. Jiuzhaigou is at the northeastern end of this scenic area in the Min Shan mountains. It is part of the Aba Tibetan and Qiang Autonomous Prefecture. ***** ( very important point ) The main scenic area stretches 80 km (50 mi) long in the form of a letter Y comprising of three main valleys – Shuzheng, Rize and Zechawa covering 720 km² (278 mi²) and offering stunning views of lakes, waterfalls, and mountains. The name means "Valley of Nine Villages", derived from the 9 ancient Tibetan villages that call it home. Its highest point is 4,700 m (15,420 ft) above sea level, with *****the main sightseeing areas between 1,980 m and 3,100 m (6,500-10,170 ft). *****So plan your walk and views of popular and most beautiful lakes considering this altitude range in mind and the list of notable lakes I wrote below. 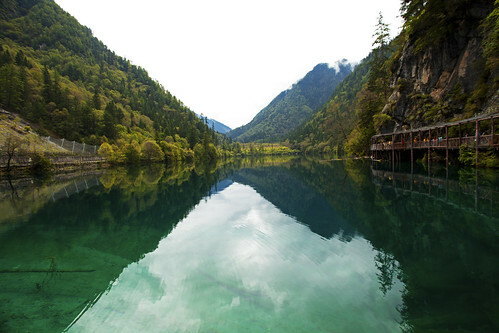 Jiuzhaigou’s best-known feature is its dozens of blue, green and turquoise-colored lakes. Originating in glacial activity, they were dammed by rockfalls and other natural phenomena, then solidified by processes of carbonate deposition (travertine). Jiuzhaigou’s water has a high concentration of calcium carbonate, making it so clear that the bottom is often visible even at high depths. The lakes vary in color and aspect according to their depths, residues, and surroundings. ***** very important point To make the most out of your one day in the valley, buy the ticket at 7AM and take the bus up the right of Y shaped valley as shows on the map in back of ticket to Primeval Forest (*** should be your first point to start your travel early morning as per my experience even in sept month . Try to be at counter no later than 6.30am and take tickets by 6.45 and take first bus starting at 7 am as it will get very crowded by say even 7.30 am or anytime later in the day . ***You can even buy water and umbrella and Rain cheater at highest point of forest..
***In my first trip to area i had just one day so i finished all i could till 3 pm and then I took bus back to entrance to start for airport at 3.30 pm sharp. Saw areas on way in quick mode and saw some areas of Huanglong near to airport before taking last flight to CKG. ****Walk the trail around the forest then walk the forest path down to Swan Lake. ***** I took first bus to the top of Y shaped valley on right side where there is Primeval Forest and then headed to SWAN lake by foot yourself to place called” Pearl Shoal” creating a noisy bubbling cascade which from a distance looks like a shawl of pearls draped across the hillside. The falls have a drop height of 21 m (69 ft) and are 162 m (532 ft) wide providing a spectacular display. ****I did all in one day. I took bus to highest point of the Y shaped map if this scenic area where lakes like Panda lake exist. Go to 3000 meters up till the point bus takes higest. Then trek down to lakes i mentioned below in this practical guide.i wish i had mire days to stay but since my holiday was just four days i could cover only major portion if it. But will be travelling again in my next leave. Tickets are only valid for one day. *With a bus pass you can take a bus to all of the sites within the park. Your pass gives you access to an efficient hop-on hop-off bus transport system. Every few minutes a bus will come to a site to pick up passengers. *Don’t miss the last bus or you must walk out! ***** very important point An effective way to use the system is to take the bus to the head of Rize valley and walk back towards the entrance and Administration building. Walking is a great option in the park, as wooden-plank trails wind through the lakes and forests. It is best to combine walking with taking the bus as the park is quite large and you won’t be able to cover enough ground on foot. Jiuzhaigou has some 114 Lakes and waterfalls. An effective way to use the system is to take the bus to the head of Rize valley and walk back towards the entrance and Administration building. Walking is a great option in the park, as wooden-plank trails wind through the lakes and forests. It is best to combine walking with taking the bus as the park is quite large and you won’t be able to cover enough ground on foot. Is at the head of the Zechawa valley. At an altitude of 3,060 m (10,039 ft) this is the biggest and deepest lake in Jiuzhaigou. The lake has a surface area of approximately 30 sq km’s (12 mi) and an average depth of 44 m (144 ft). On clear days its dark wooded hillsides and blue waters are viewed against the backdrop of the 5,000 m (16,404 ft) snow capped Min Shan mountains. This lake has no major inflow and receives its water from underground sources. The local Tibetans have their own name for this lake, which translates, to “The Lake that never dries out.” Take the bus to the Long Lake and Jade Colored Pool because it is too far to walk to. Also known as the Jade pool, is a small lake of 5,600 sq m (60,000 sq ft) at an altitude of 2,995 m (9,826 ft) and with an average depth of 6.6 m (21.5 ft). It is fed by underground streams from Long lake. Although small this lake must be rated as having one of the most varied and intense colour ranges of Jiuzhaigou and should not be missed. The lake systems in the lower parts of Zechawa valley are seasonal and are often dry in summer. Walkways are provided from Long Lake to a bus pickup point just passed the lower seasonal lake. 100 m (328 ft) lower is completely covered in snow and ice. The lake is surrounded by Bamboo groves and together with the Panda Lake. Panda Lake has an average depth of 14 m (46 ft) and as its name implies is in the heart of panda country. This 90,000 sq m (969,000 sq ft) lake at 2,590 m (8,500 ft) altitude is surrounded by bamboo forests and a mix of deciduous and coniferous woodland. This vivid green lake becomes a feast of colour in the autumn. The lake is home to many small and curious Songpan Naked Carp that gather in large numbers when a leaf or pebble falls into the lake. The fish are protected and must not be fed by visitors. Over a series of travertine terraces. A well-maintained wooden walkway allows visitors to descend beside the falls providing a unique way of seeing the spectacle. Are best viewed by taking the walkway. This takes visitors across the “Golden Bell Lake” and “Pearl Shoal” down the left side of the falls then across the base of the Falls to “Mirror Lake”. The shallow waters rush over the 160-m (525 ft) wide travertine shelf called” Pearl Shoal” creating a noisy bubbling cascade which from a distance looks like a shawl of pearls draped across the hillside. The falls have a drop height of 21 m (69 ft) and are 162 m (532 ft) wide providing a spectacular display. Is so named because of its ability to reflect the images of the surrounding mountains and forests. The lake at an altitude of 2,410 m (7,907 ft) is in a sheltered section of the valley running east west which produces its glassy reflective surface.The Lake was featured in the Zhang Yimou movie Hero. The outflow of “Mirror Lake” is through the “Rize Gully” a travertine ramp of small ponds and natural bonsai trees and bushes that lead directly to one of the great sights of Jiuzhaigou . The Nuorilang waterfall. At 2,315 m (7,696 ft) and with a surface area of some 200,000 sq m (2,153,000 sq ft) is the largest lake in the Shuzheng valley, and also the deepest with an average depth of 12 m (39 ft). The lake derives its name from a legend that tells of a monk from Tibet riding a rhinoceros. When the monk came to this lake he was so entranced with the local scenery that he accidentally rode his rhinoceros directly into the lake. Bedecked with prayer flags, is one of the nine Tibetan villages that give Jiuzhaigou its name. Situated above the Shuzheng Lakes it is easily accessed from the roadway. Here you can visit a traditional Tibetan home and drink “Yak Butter tea“. The steep main street is lined with shops selling trinkets, Tibetan artifacts and souvenirs. Contains a large travertine shelf that extends across the floor of the lake. Locals say it looks like a sleeping dragon and that the head and tail seem to move as the wind ripples the lake surface. ***Jiuzhaigou is all about seeing! The colours of its lakes, trees and mountains are breathtaking and defy adequate description. The altitude changes within the valley to create continual variations of flora, which give each lake and waterfall a unique quality. When entering the park you will be herded effectively and politely into one of the many queues waiting for transport. Once in the system you are a free agent with respect to where you go and what you see. Jiuzhaigou’s landscape is made up of high-altitude karsts shaped by glacial, hydrological and tectonic activity. It lies on major fault lines on the diverging belt between the Tibetan Plateau and the Yangtze Plate, and earthquakes have also shaped the landscape. The rock strata is mostly made up of carbonate rocks such dolomite and tufa, as well as some sandstone and shales. The park is the natural habitat for two of China’s most treasured endangered species – the Giant Panda and the Sichuan Golden Snub-Nosed Monkey (???). However, due to the park’s size and the number of tourists, the chances of seeing them are slim. About 20 pandas reportedly live within the boundaries of the park. There is probably higher chance of seeing them in Zaru Valley, the valley dedicated to eco-tourism as of July 2009. In the main valleys you are more likely to see other creatures including birds (140 species have been recorded here), insects and fish. Beyond them the rocky slopes and snow-capped peaks of the Min Shan range dominate the view. The main departure points for a visit to Jiuzhaigou are Chengdu – the capital city of Sichuan, famous for its Panda Breeding Centre – Chongqing and Xi’an. Although Jiuzhaigou is only around 350km from Mianyang, and 460km from Chengdu (as the crow flies), the journey takes between 8 and 11 hours due to the winding mountain roads through some spectacular scenery along the valleys of the Fu or Min rivers. Many tour companies break the journey into two components with overnight stops either at Mianyang or Maoxian. Important note: following the Sichuan earthquake of 12 May 2008, the road to Juizhaigou via Wenchuan and Maoxian is not recommended. The road between Chengdu and Wenchuan is excellent but Mao Xian – Chuan Zhu Si is undergoing landslide prevention and road widening works. As of September 2009, the bus from Chengdu to Jiuzhaigou can take up to 17 hours (!) although this is the exception rather than the norm. The regular time is 7-11 hours now that some of this work has been completed. During National Week 2009 the Chinese government was not allowing foreigners to travel to jiuzhaigou by road in any form. These restrictions were lifted again as of 10 October 2009. Flights between Chengdu and Jiuzhaigou Huanglong airport (IATA: JZH) are available on Air China, Sichuan Airlines, South China Airways and China Eastern. As of October 2009 direct flights are also available from Beijing, Shanghai and Hangzhou on Sichuan Airlines. Jiuhuang airport is about a 1.5-hour drive from the park entrance. This can be done by taxi or mini-bus. Public Bus services are available from the Xinnanmen and Chadianzi bus stations in Chengdu to Jiuzhaigou with 2 or 3 departures from each station daily depending on demand. Ticket price is approximately ¥110-145. Taxi: If there are a few people, it may make sense to charter a taxi to/from where you’re going. Fares of ¥600-700 to Langmusi have been reported. It is also reportedly possible to take a taxi to/from Chengdu for around ¥1200, which is probably cheaper than flying for 3 people and much more comfortable than a bus. During peak season is ¥220 which includes an insurance fee of ¥3. Disabled visitors, Seniors between 60 and 70 years of age, students and soldiers get a discount price of ¥170. Children no taller than 1.3 m in height, government servants, and seniors over 70 get in free. if you want to save the money of the tickets, you can walk till the main tourist center(about 10 km – a nice walk) and from there just go with the buses. the Conductors don’t check for tickets from there. Previously there were two day tickets that are no longer on sale during the peak season. These are on sale in the off peak season. Off peak ticket prices: Entry – ¥80 N.B. In the dry season (February) many of the wooden trails in the park are closed and marked as fire hazards. It is possible to walk on the roads in the park although there are some signs saying this also isn’t formally allowed. The only other option is to bus around the park. For environmental protection reasons, no personal transport, not even bicycles, are permitted within the park. note – the food and drink in the Reserve is very expensive (dish of rice about ¥30, noodles ¥15, Small bottle of water ¥5) so it’s a good idea to obtain supplies in the shops outside before you enter. There are many areas to drink. You will find one of the best local Tibetan tradition is to drink Tibetan butter tea. There is a surprising amount of bars available on bian bian jie (???) which is one of the most famous cobblestone roads in China. 6868 bar, (Just past the Sheraton off main road in the small town there). Any cab driver should know this place. Typical chinese-style club, with a dance floor, private rooms, and lots of tables with drinking games. If you want to drink with the locals, worth checking this place out…remarkably good light system and sound system for the rural area. There are now a number of 5 star, 4 star and 3 star hotels and cheap hostels just outside the park. The price for a 5 star hotel such as the Jiuzhaigou Xilaideng International is from ¥600-1,000. Also there is a Sheraton that can be had for about ¥500-800/night through travel agents. For 4 star hotels like Chang Qing binguan (???? ), the Geshang hotel, the Chinese Travel hotel, and the Golden Harbour Hotel room prices are from ¥400-900. A 3 star hotel such as the Xing Long binguan(???? ), Qianhe Hotel etc. is from ¥300-800. Prices vary according to the season and booking in advance is essential. Provided you speak and read mandarin bookings and purchase of tickets can be done online at [www.jiuzhaigouvalley.com]. Uncle Jiang’s family house, Peng Feng Village, Jiuzhaigou Park Entrance. They have free pick-up and offer packed lunches (sandwiches) for ¥20. There is lodging located in the villages along the street outside the park entrance. For budget travelers the best option is the Jiutong Bingguan (????) located next to the bus station. Touts crowd around arriving buses and can lead you to alternative budget options. In the winter months the park is extremely cold and it is necessary to dress warmly. Having said that, in the winter sunshine you could possibly strip down to a t-shirt in the bright winter sun shine – in the shade you’ll need to layer up again however! Chinese tourists dread standing in line and there is a lot of pushing and shoving getting on and off buses. Make sure you don’t get pushed in front of an oncoming bus. Crowded trails can also be dangerous and if you walk on the edge of a path it is likely a shoulder or elbow with push you off. To really enjoy your time in the park you should walk on the trails on the opposite side of the lakes from the roads. These trails have considerable less tourists and you can really experience the serenity of the national park there. Everyday there are buses going to Songpan at 7:20AM and take two hours, Chengdu (10 hours) and Huanglong National Park. Bus times vary from time to time. It is best to keep an eye on the Jiuzhaigou website  for up-to-date times. This is a guide article. It has a variety of good, quality information about the park including attractions, activities, lodging, campgrounds, restaurants, and arrival/departure info. Plunge forward give your info and contributions in comments to make it a star!